Your client can definitely take part in the Thanksgiving staple this year. Turkey meat has a lot of antioxidants that are great for people who suffer from diabetes, and it's low in unhealthy fats (as long as you take the skin off). Have your client try to keep the portion under about 4 ounces of meat, though, and tell him or her to keep the gravy to a minimum. A clearly healthy option, vegetables are a great choice for people with diabetes. Have your client fill up on raw or steamed vegetables - not casseroles - before partaking in the more decadent Thanksgiving options, so he or she eats a little less of the not-as-healthy food. 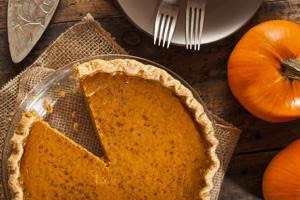 Sure it's dessert, but pumpkin pie is a much healthier option than pecan pie or most other sweet treats. If you want, make a more diabetic version with your client that they can bring along to dinner using a sugar substitute and lower-fat ingredients.